The Law Clerk with Internship program at CDI College prepares students to pursue a traditional career path as a law clerk, working under the direct supervision of a lawyer. Law clerks are able to work in several areas of law including criminal law, family law, civil litigation, environmental law, corporate law, healthcare, real estate, and wills and estates. Students in the Law Clerk with Internship program will have the opportunity to gain real-world experience in a law office or other legal environment, giving them invaluable experience that can be added to their resume. In addition to their Law Clerk with Internship diploma, graduates can apply to write the four exams in litigation, corporate, real estate, and estates law required to join the Institute of Law Clerks of Ontario (ILCO). At the completion of the in-class portion of this program, students are required to attend an Internship as part of the curriculum. This course will focus on verbal and written communication skills in the legal environment. Students will learn how to select, draft, complete and revise legal documents within the context of understanding a party’s legal interests, rights, or responsibilities with respect to a proceeding. Researching case law, statutory law and procedural law will also be included and students will be taught how to communicate effectively with clients, opposing council, and court personnel. This course will provide Paralegal students the skills required to produce and edit legal documents and forms. The paralegal student will be aware that using computers is very important to not only preparing and completing legal forms and documents, but will also be necessary for managing files and documents for the paralegal practice. Students must keep in mind that they must also have sufficient computer skills to work in a legal firm or department and most often will be required to use their computer skills in their field placement. This course prepares students to the typical legal work environment which they will encounter as law clerks. The emphasis is on a professional approach to daily tasks and procedures such as research, document preparation, scheduling, interaction, and communication with clients, coworkers and management. Students learn the fundamentals of performing a law clerk’s job ethically and competently. This course will provide students with a fundamental understanding of the basics of drafting inter vivos documents, or those documents drafted during a client's lifetime to plan for disposing of financial, legal and other assets on incapacity and on death. Secondly, students will learn how to process an estate either when a deceased has left a will, or has not. Third, the students will learn the Rules of Civil Procedure which apply to contesting the distribution of assets included in an estate. Students will be introduced to use of a diskette to prepare a will, a power of attorney for property and a power of attorney for personal care. They will also be introduced to Estate-a-base, a software program for use in estate matters, to prepare formal court documents, including Applications, Certificates, Affidavits and Notices as well as a Consent, Bond and Renunciation. This course will focus on the major areas of family law: divorce, custody, access, support and division of property. Students will learn both the substantive law and the procedure under the Family Law Rules including the preparation of court documents and Domestic Contracts. Students will study the Divorce Act, Children's Law Reform Act, Family Law Act, the Federal Child Support Guidelines and the Family Responsibility Act. The students will learn Divorce mate. This course focuses on residential tenancies and the administrative machinery required for dealing with landlord/tenant disputes. The Residential Tenancy Act (the governing legislation), and the Rules of Practice and various Interpretation Guidelines published by the Landlord and Tenant Board are studied. Students will be given an opportunity to observe several tribunal(s) in action and to participate in a moot tribunal. This course will provide students with a fundamental understanding of the foundations of administrative law in Canada. Concepts canvassed include private and public law, procedural and substantive law, and statutory and common law. Students will learn the rules of natural justice and procedural fairness. Students will also demonstrate an understanding of the Statutory Powers Procedure Act and Judicial Review Procedure Act. Students will learn the process for reviewing the authority, form and function of administrative tribunals, and how advocacy is conducted before these boards. The application of the Charter and human rights legislation will be canvassed. This course will provide students with a fundamental understanding of the many facets of representing a client, including file and client management, principles of advocacy including courtroom etiquette and strategy. Students will be introduced to the practice and procedure in small claims court as well as being given the opportunity to prepare for and conduct a mock trial. During this module students will be introduced to the Ontario Court of Justice for the purpose of representation of an accused in a quasi-criminal case. The module is designed to cover, in an introductory fashion, the procedural requirements, set by the Provincial Offences Act, in bringing a quasi-criminal matter before the court. From the statute of general application in the provincial court, the students will move to the substantive legislation under which the majority of defendants are charged in Ontario. The goal of this module prepares students to represent clients charged under any provincial offence setting statute (as authorized by law) with a particular focus on traffic offences. The students will be required to manage a precedent file, giving consideration to procedural aspects as well as answering legal questions using knowledge of statute law, case law and common law. This course will provide students with a fundamental understanding of Canadian criminal law. Concepts canvassed include Federal statutes which create offenses, jurisdiction over substantive criminal law, procedure and the administration of the courts. Students will learn the organization of the court system and the role of the components of our criminal law system. Students will also demonstrate an understanding of the Criminal Code, interpreting the offenses, procedure and sentence options. Students will learn the precepts of the Charter which apply. Students will be introduced to Summary Conviction procedures. This course will provide students with a fundamental understanding of the basics of Corporate and Business Law. Students will learn how to recognize and complete numerous forms dealing with the day to day procedures involved in dealing with business and corporate entities. The student will also learn how to prepare the necessary documentation for incorporating a company and the forms involved in the day to day running and maintenance of that company. Students will become familiar with the different government agencies that regulate businesses and corporations and how to deal with them effectively. Additionally, students will acquire knowledge of the principles of business and corporate law and the principles that accompany them. This course will provide students with a fundamental understanding of the basics of residential real estate transactions. The students will learn the Rules of Professional Conduct pertaining to residential real estate transactions and e-Reg, (electronic document registration) and the substantive law under both the registry and land titles system. The students will also learn how to process both a purchaser's and vendor's file from file opening to reporting to the client after the transaction is complete. The students will use both Conveyancer and Teraview to process the real estate files. This course will provide students with a fundamental understanding of the basics of Civil Litigation. Students will learn to open and carry a civil file from start to finish and be able to prepare the necessary court documents. They will gain the basic understanding of when and how court documents should be prepared and to gain confidence in filing those documents. Additionally, students will acquire knowledge of the principles of civil litigation and the rules that accompany this area of law. Students will learn how to collect a judgment once issued. This course provides students with a fundamental understanding of the law of contract and the fundamentals of contract drafting. It also provides students with a basic understanding of the law of torts and the social policies, which support this method of the compensation of individuals who sustain losses at the hands of others. The elements of proving losses which are compensable under tort law, the damages which may be compensated and the defenses available to the person who is responsible for the loss are reviewed. These tort concepts are applied in drafting civil litigation pleadings. This course provides students with an application of the basic principles of administrative law and the general nature, functions and procedures of administrative tribunals, to two specific administrative tribunals: WSIB and the Ontario Human Rights Tribunal. Students are provided an opportunity to study the enabling statute, regulations, applicable policies and procedures for each of these tribunals. This course provides students with a fundamental understanding of the basics of the law of intellectual property. The concepts of copyright, trade-marks, patents, industrial designs and integrated circuit topographies will be canvassed. The role and function of the Canadian Intellectual Property Office, an agency of Industry Canada, will be reviewed. This course will provide students with a fundamental understanding of the basics of employment law. The students will learn the jurisdictional distinction between federal and provincial employment statutes, and the application of each. Students will learn the statutory minimum standards for employees in the provincial workplace from the Employment Standards Act 2000, the Ontario Human Rights Code, and the Occupational Health and Safety Act. They will also learn about income replacement and rehabilitation programs through WSIB, CPP and the Employment Insurance Act. Students will review alternatives for seeking remedies for employees terminated from their employment both through administrative tribunals and the civil courts through wrongful dismissal actions. Finally, students will be provided with an overview of the Ontario Labour Relations Board. This course provides students with practice in the soft skills of practice including interviewing clients to determine the client's goals, objectives and expectations. Additional topics are how to effectively gather information, preparing for dispute resolution and the process of resolving disputes through principled negotiation. Ethics and professional responsibility are the cornerstone of the legal profession. Students will learn the rules which govern the practice of law in Ontario, apply those rules to daily practice, the scope of authorized practice and practice management. Students will review practice management, including tracking time (dockets) both manually and electronically, organization, scheduling systems, tickler systems, conflict of interests, retainer agreements, new client information sheets, opening, managing and closing files and best practices/pitfalls. Students will be exposed to Rule 5 (Fees and Retainers), Bylaws 8-10 and Paralegal Practices as per the Law Society Guidelines. Students will learn the accounting software program, PC Law, and will be required to complete assignments and a 3 day in - class, Practical Exam using the software. Students will be introduced to Law office accounting including general and trust accounts. Students will be exposed to fees, bank accounts, trust receipts, disbursements, petty cash, HST, and client billing. Students will also be exposed to the financial obligations of a law practice incurred by a paralegal for the law firm or on behalf of clients, and will be required to pay vendor's invoices and print various lists and records. Students will learn about legal aid and its billing procedures. This course will provide students with a fundamental understanding of legal research within the Canadian legal system. Students will learn how to identify legal issues from a set of facts and draft an internal memorandum to file. Students will learn how to access and use secondary sources of law and how to access both from the internet and Westlaw. Students will also learn how to identify and access primary sources of law including statutes, regulations and case law. Skills demonstrated by students will include drafting case briefs, legal memorandums and factums. This course will provide students with a fundamental understanding of the Canadian government and political system. Concepts canvassed include private and public law, procedural and substantive law, and statutory and common law. Students will learn the organization of the court system and the jurisdiction of the courts of first instance. Students will also demonstrate an understanding of our Constitution, its impact on federalism and the precepts of the Charter. Students will be introduced to legal research on the internet and Westlaw. Finally, students will be introduced to common legal terms and documents. Start Training to Become a Law Clerk! 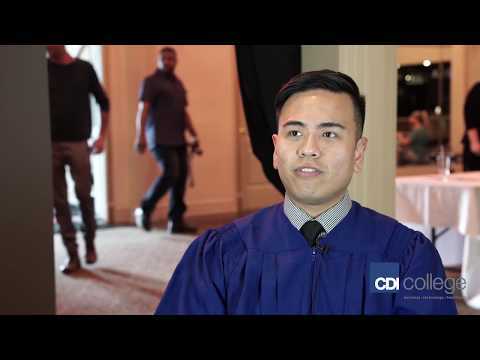 Apply today to CDI College and you'll get the job-ready training to become a law clerk.